A new composite image of the star cluster NGC 1333 has been produced. 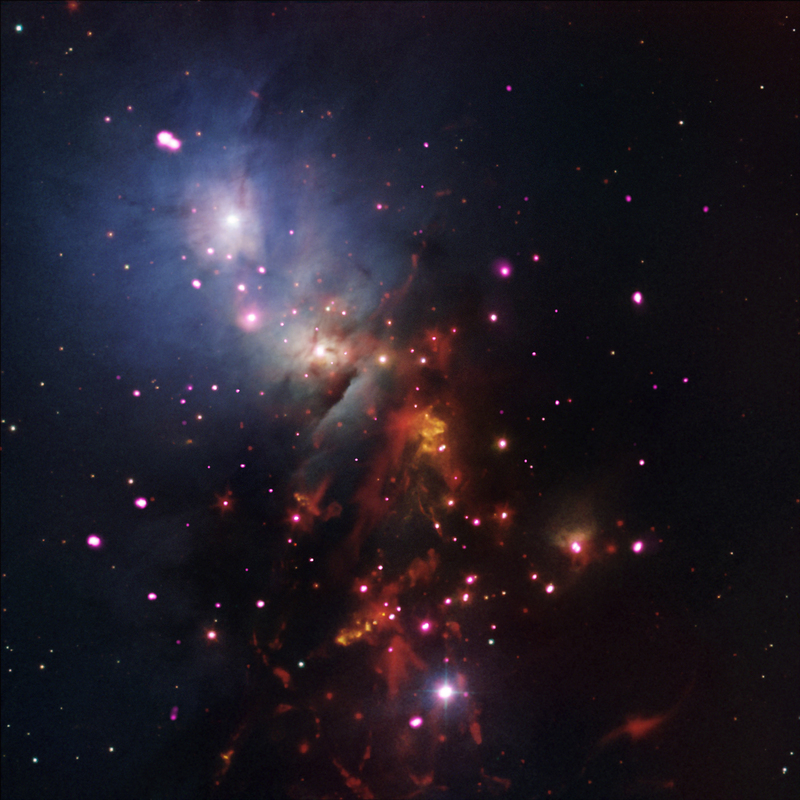 NGC 1333 is about 780 light years from Earth and contains many young stars. X-rays reveal information about the brightness and other properties of these very young stars. 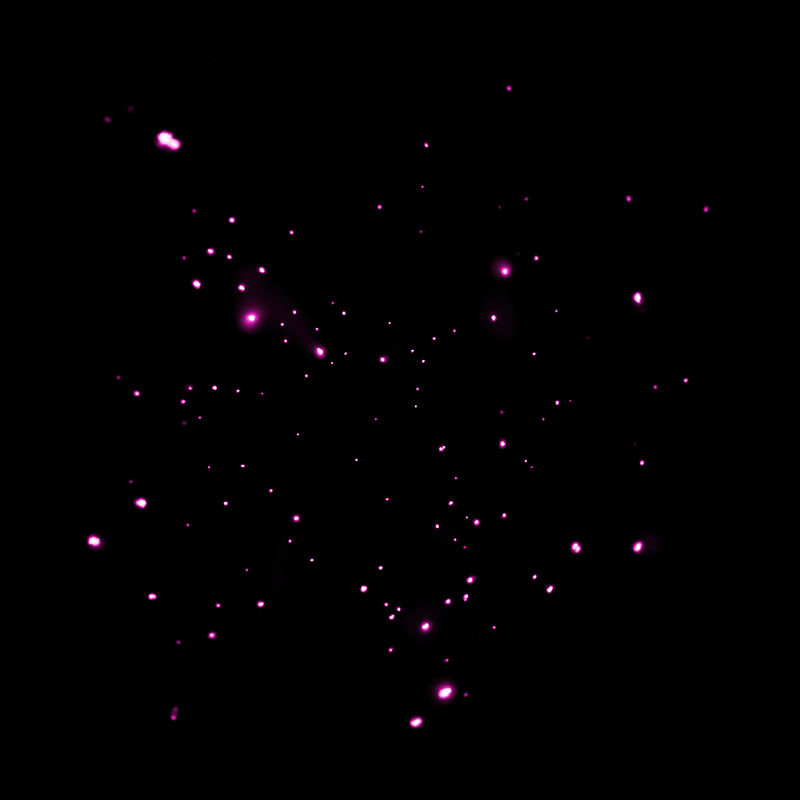 This new composite image combines X-rays from NASA's Chandra X-ray Observatory (pink) with infrared data from the Spitzer Space Telescope (red) as well as optical data from the Digitized Sky Survey and the National Optical Astronomy Observatory Mayall 4-meter telescope on Kitt Peak (red, green, blue). The Chandra data reveal 95 young stars glowing in X-ray light, 41 of which had not been identified previously using infrared observations with Spitzer because they lacked infrared emission from a surrounding disk. These results were published in the July 2010 issue of the Astronomical Journal and are available online. NASA's Marshall Space Flight Center in Huntsville, Alabama, manages the Chandra program for NASA's Science Mission Directorate in Washington. The Smithsonian Astrophysical Observatory in Cambridge, Massachusetts, controls Chandra's science and flight operations. JPL manages the Spitzer Space Telescope mission for NASA's Science Mission Directorate, Washington. Science operations are conducted at the Spitzer Science Center at the California Institute of Technology in Pasadena. Spacecraft operations are based at Lockheed Martin Space Systems Company, Littleton, Colorado. Observation Time 36 hours 7 min (1 day 12 hours 7 min). This is wonderful thank you for posting this on the internet. NGC 1333 is a cluster that contains many stars that are less than two million years old, which is very young in astronomical terms. X-rays from the Chandra X-ray Observatory and optical data from DSS. About 4 light years across.